As February comes into full swing, many Minnesota residents are scrambling to find the best plans to make the most of a certain holiday that sneaks up on many people — Valentine’s Day. This holiday is focused more on chocolates and hearts instead of Roman executions, yet it still holds a lot of value for many couples looking to up their romance. As your favorite brew pub in Minneapolis, The Herkimer is here to serve as a bastion of comfort and delicious beers for the holiday. While many people think that a quality sports bar and grill isn’t the most romantic place to get lovey, our fun staff and delectable menu tend to disagree! Today, we’ll briefly highlight a few date ideas that may make your V-Day a cherished memory. If you and your better half are looking for a place to chow down, be sure to check out our craft brewery first! The sunset provides the perfect ambiance for traveling a winter wonderland with your wonderful spouse. You can explore hard to reach places or enjoy a stroll through the park. Remember, though, that this activity will be outside, so bundle up! Our city has numerous comedy shows for Valentine’s week, giving you and your loved one a range of comedians to laugh at. Comedy shows are a great way to enjoy a night out without the high costs and pressures associated with a standard date. Minneapolis is often full of snow during the season of love, making it convenient and romantic to take your sweetheart on a romantic ride. Our city has a number of carriage services available, allowing you to ride along the Mississippi River, through Boom Island Park, or anywhere else that horses seem to be waiting. One way to feel cultured and classy while getting your booze on is to make a reservation for a multi-course wine dinner. These events feature quality pairings that serve to enhance the flavors of both your meal and vintage beverage. One fun and ultra-entertaining way to make the most of your V-Day is to get tickets for a murder mystery dinner show. The Dinner Detective, for example, is proud to be an “interactive comedy murder mystery dinner show”, getting the audience involved with solving who the murderer is. If you are not a fan of large social interactions, or if you have a fear of being targeted as the prime suspect for a felony, this show may not be a top choice. Valentine’s Day is often summarized as a high-pressure event that does more to feed commercialism than it does to enhance your relationship with your significant other. The Herkimer is proud to be your hotspot for the holiday, providing the best foods and brews at our brewery bar. We strive to avoid the high pressure and expectation for Valentine’s Day, delivering quality alternatives to our patrons. 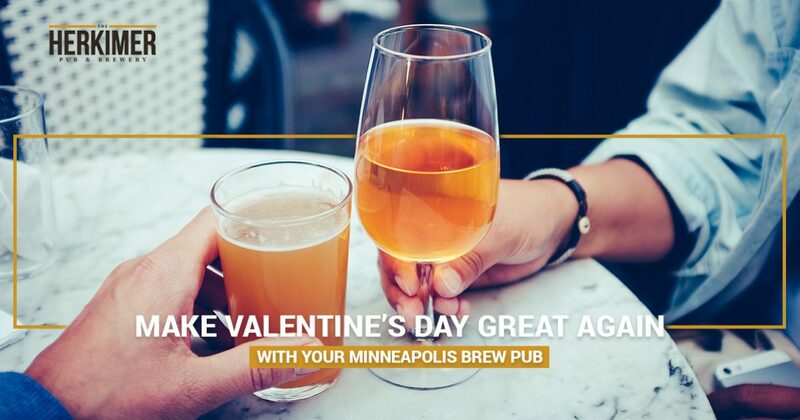 If you’re thinking “A good date should be hosted at a brewery near me”, then our brewpub in Minneapolis is the way to go. Contact us today to learn more about our craft beer pub or make your reservation here to set the stage for an unforgettable evening!